When a company lets the general public make a decision, the results can vary wildly. It's how the Mets got Rickrolled and Justin Beiber almost got sent to North Korea. It's how the world got Boaty McBoatface and John Scott at the NHL All-Star Game. All four of these examples were excellent choices, but in every instance, the people in charge weren't thrilled about the outcome. Krispy Kreme dared to walk this path recently, asking doughnut lovers for suggestions on a new flavor. Nearly two million people cast a vote in a doughnut election that wasn't quite as open as the vote that led to Boaty McBoatface. Only four flavors were made available to voters. But now the time has come for the winner, Lemon Glaze, to be unleashed on a public that craves dessert for breakfast. The Lemon Glaze Doughnut will only be available for a limited time. The spring-themed pastry debuts April 23 and is available until April 29 at Krispy Kreme locations in the US and Canada. "The bar doesn’t get any higher than our Original Glazed Doughnut! 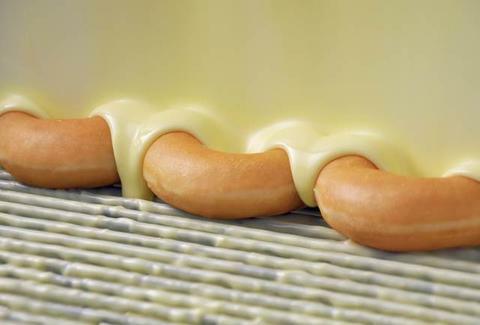 Experimenting with the many flavor profiles lemon presents to create an all-new lemon glaze was a fun, but serious culinary challenge," said Krispy Kreme's Chief Marketing Officer Jackie Woodward. "There has been so much anticipation and zest for the new Lemon Glaze Doughnut, we can’t wait to share the joy with our fans!" It sounds good, but it's hard not to feel cheated. Why isn't this just the Nutella-filled doughnut that was only available in the Dominican Republic?